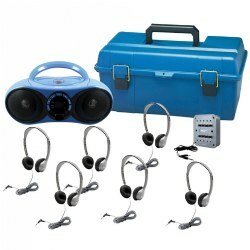 Stock your classroom listening center with CD players, cassette recorders, animal-themed headphones and other audio accessories to help students improve their listening and comprehension skills. Flexible/adjustable headband, mini plug with a 6 ' cord with right-angle plug. On a flexible, adjustable headband with durable ABS ear cups 3.5mm jack On-ear Right/Left Output Difference - 3 db Rating Input - 20 W Volume Control - N/A Cord - Cup - ABS plastic for durability Weight - 6 oz. Individual Stereo Headphones Labeling area to personalize with student name. Comes with moisture resistant storage bag. 3 years & up. 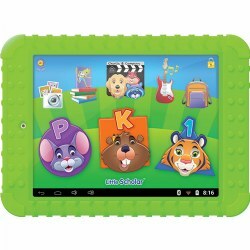 Durable and made from a single piece of EVA foam, which is soft and an extremely flexible material. Includes a snap-on extension band for smaller children for a snugger fit. The clear sound quality will never exceed 85 decibels, ensuring young developing ears are protected. 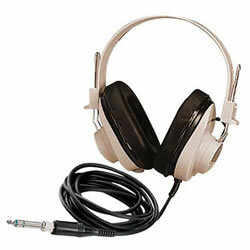 3.5mm stereo plug and 4' cord length. 3 years & up. Deluxe headphones with volume control feature a high-quality sound. Noise-isolating, closed-back design features unique 6' Dura-Cord™ (chew, kink and knot resistant) designed to be durable and reliable. Play the radio, a cassette, or a CD, and record from any of these sources to tape, using the this compact versatile unit. The Spirit Boom Box features four speakers provide super sound quality, AM/FM stereo with telescopic FM antenna, easy top-loading compact disk player, one-touch recording, and a headphone jack. AC/DC operation (power cord included) or requires 8 C batteries to take anywhere (Batteries not included). 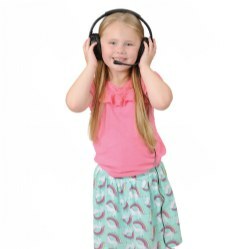 These rugged and lightweight stereo headphones with in-line volume control feature on-ear design with leatherette cushions, chew, kink, and knot-resistant 6" Dura-Cord™, and the Anti-lice storage bag that are perfect for day-to-day lessons and testing. Built to deliver the latest audio technology to the classroom in an easy-to-use package. The CD player handles recordable media including CD-R and CD-RW as well as play back MP3 files through the USB port. The 3W amplifier and built-in speaker deliver clear sound to small groups. 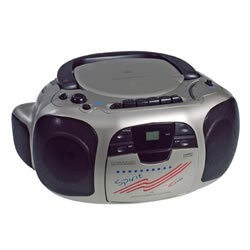 This CD player is a great way to give audio and music lessons to students of all ages. Runs on 6V wall power adapter or 4 "C" batteries (not included). 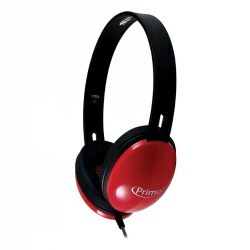 Primo™ headphones feature noise-reducing earcups allowing students to clearly hear lessons and protect from unnecessary, distracting noises. Made of ABS plastic, the chew and kink-resistant Dura-Cord™ and 3.5mm stereo plug are rugged and reliable, making it a versatile unit. Connects to almost any audio device: tablets, smartphones, computers, and more. Dual volume controls on earcups, padded leatherette ear cushions, 10 foot coiled cord with mini plug and Snap-On 1/4" adapter. Includes standard 1/4" phone plug for connecting to cassette players, phonographs, and jack boxes. Adjustable headband for comfort. 5' straight cord. Compatible with items 47618 and 81264. 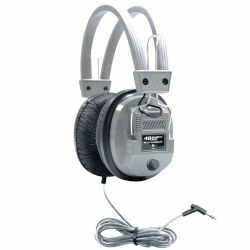 Lightweight, compact, adjustable headphones with removable, replaceable, washable ear cushions are ideal for computer labs and learning stations. Exceptional sound output with volume control on cord. Compatible with all computers. 6 1/2' cord. 3 - 10 years. 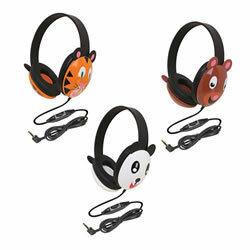 Add interest to your listening center with these adorable animal themed headphones. 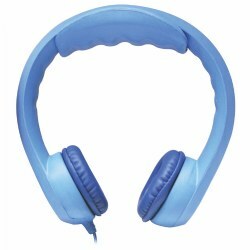 Features include volume controls, slotted baffles to protect against accidental perforation on the internal speaker and ambient noise-reducing earcups to help children focus on their tasks. 3 years & up. Classroom-proven, durable and dependable listening center provides flexibility and comes with everything for up to 6 students. 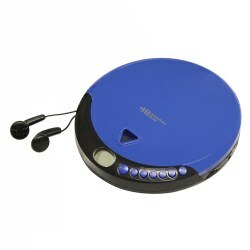 Features a top-loading, portable CD player, six Deluxe headphones, a stereo jackbox with individual volume controls and a compact, portable, lockable carrying case. This 6-person listening center with Bluetooth® Boombox plays CDs, cassettes, FM radio, and with the built-in Bluetooth® you can wirelessly stream through the Boombox from your Bluetooth® enabled devices or you can playback media from non-Bluetooth® devices via the AUX IN jack. 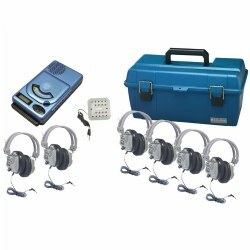 Includes 6 on-ear personal headphones, 1-eight position stereo Jackbox with individual volume controls, and 1 lockable carrying case. Lock not included. 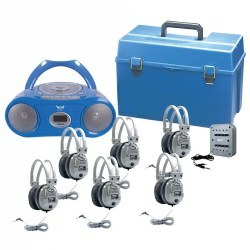 Complete listening center system for eight students includes jack box with individual volume control, eight headphones and a handy carrying case. Headphones feature replacable, clip-in coiled cords. 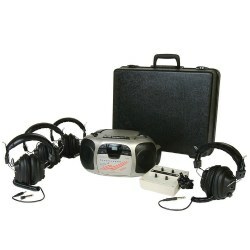 Complete listening center includes the Spirit boombox, four switchable mono/stereo headphones, one stereo jack box and a carrying case. 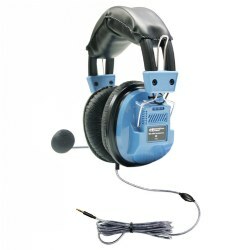 This headset features adjustable gooseneck microphone, foam ear cushions, and an easy-to-wear adjustable headband. The TRRS plug is the perfect companion to any of your Apple devices, tablets, Chromebooks, or almost any mobile device. 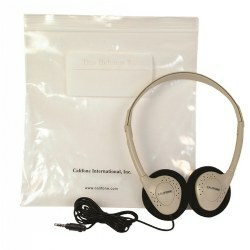 Tough, lightweight designed headsets come in their own heavy-duty, write-on, moisture resistant, re-closeable anti-lice storage bag. Featuring fully digital controls, this dual cassette recorder allows you to record from CD's, radio or from one cassette to another. Can program up to 20 FM stations and 12 AM stations in memory. 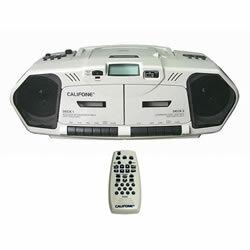 Programmable CD player can play up to 20 tracks in any order you choose. External headphone jacks for 3.5mm or 1/4". May be used with permanently attached AC cord or 8 D batteries (not included). Remote control included. 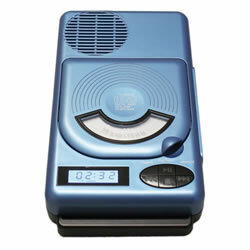 Unit measures approximately 16 1/4"W x 6 1/4"H x 9 1/4"D.
This Personal CD / CD-R Player is built for extended use both in and out of the classroom, and is a great, economical way to give individual audio and music lessons to students of all ages. This programmable CD player features a 60 second skip protection technology, low battery indicator and digital volume control. 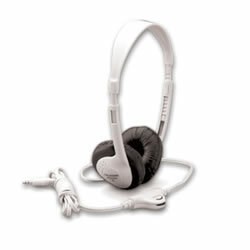 Comes with stereo ear buds and will provide the quality and portability you require in a CD Player. 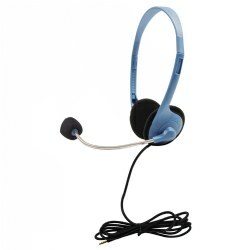 This headset features over-ear noise-reducing, swivel ear-cup design; soft, washable, and replaceable leatherette ear pads and a soft padded headband. Easy to mark light blue color and exclusive chew resistant, PVC-sleeved, braided 4' Dura-Cord™ for long-term durability and an anti-lice bag. 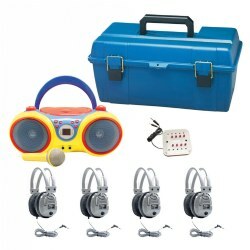 This durable system with fun colors, easy functionality of the karaoke boom-box, SC-7V headphones, a Jackbox with 8 headphone inputs, and a plastic carrying case will you help you create a versatile and functional center in your classroom for years to come! 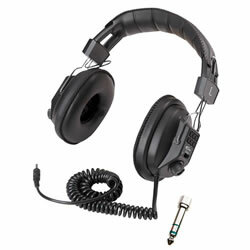 MACH-2™ is the new deluxe, stylish, robust, versatile multimedia USB headset that will connect to any device with a USB port. 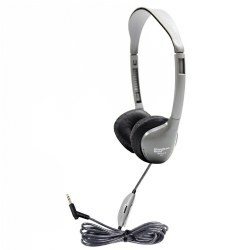 Features high quality integrated USB sound, steel reinforced gooseneck microphone with in-line volume control, soft, leatherette ear cushions delivering excellent noise-isolation, and an adjustable, folding headband. Each headset comes with an exclusive chew, kink, and knot-resistant Dura-Cord™ and an Anti-Lice storage bag perfect for everyday classroom use. Juke24™ Flex Listening Center comes with six (6) red Flex-Phones™, a red eight station jackbox and Juke24™. 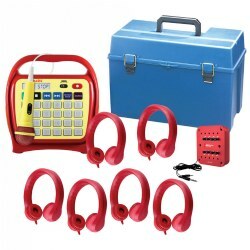 Meet the needs of your students by helping them build their listening, vocabulary, and language skills with this classroom proven listening center that supports streaming from Bluetooth® items such as smart phones, tablets, computers and more. 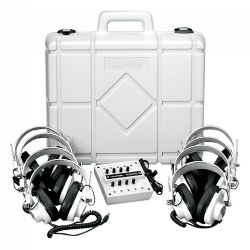 This listening center includes everything you need for 6 students: a media player, six headphones, one jackbox, and a carrying case.